With its warm, southern climate, the state of Georgia provides an ideal location for several types of fruit and nut trees. Gardeners across the state grow a large variety of ornamental and edible fruits and nuts. Unlike northern states, the long growing season gives semi-tropical trees sufficient time to form blossoms and fruits. Fruit trees thrive in many areas of the United States but certain varieties prefer Georgia's climate, rainfall and soil conditions. Trees in Georgia produce fruits and nuts. Peaches flourish and are a prized crop of many Georgia farmers. Expect local nurseries to ship your peach trees around the end of December or January. The cooler temperatures during this period will minimize damage to young trees. Peach trees require good soil preparation. They prefer a sandy, loamy soil that provides good drainage. Plant your peach trees in an area that receives bright sunlight. Like many fruiting trees, the peach trees in Georgia require regular pruning to remove crowded branches that may hinder air movement and limit light exposure. Peach trees reach between 15 and 30 feet. They produce attractive, fragrant blossoms in the spring and pitted fruits in the late summer through fall. Although pecans hold the favor of many Georgia orchardists, almonds thrive in this state. A close relative of peach trees, almond trees produce white blossoms that resemble peach tree flowers. Some almond trees require other trees to cross-pollinate with, while other varieties exhibit the ability to self-pollinate. Almond trees need similar pruning, watering and soil conditions to peach trees, making them a suitable plant to grow alongside. A small variety of nut tree, almonds make nice ornamental plants around driveways and sidewalks. While these trees flourish in most of the state, areas with excessive late-summer heat and humidity may hinder the growth of these trees and cause nut rot. The timber from black walnut trees provides a source of income for many Georgians. These trees grow as tall as 100 feet and can reach about 7 feet in circumference. This native North American tree prefers well-drained soils. 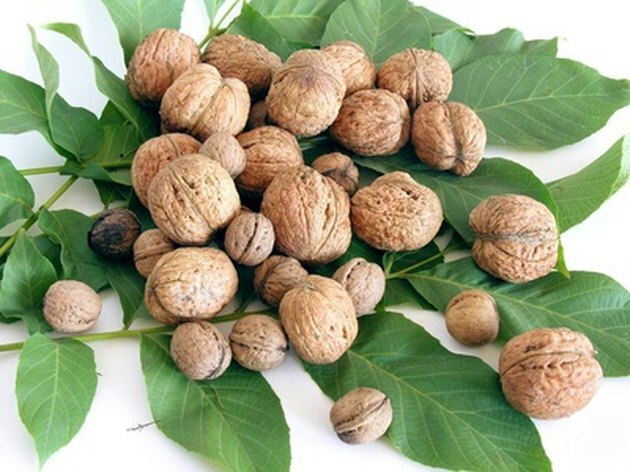 Depending on the variety, walnut trees begin producing nuts within 15 to 20 years. Some varieties of juneberry trees grow naturally in Georgia's Piedmont woods. With more than 25 species, juneberry trees grow between 15 and 25 feet tall. Although uncommon, some grow as tall as 40 feet high. This ornamental tree produces masses of small white flowers during April. The bright foliage enhances many autumn landscapes with splashes of yellow orange and red. Local Indian tribes used the fruit as part of their winter food staple. The small berries ripen in June, providing a tasty treat for birds and wildlife. Do Pecan Trees Produce Every Year?